A common cause of back pain is a herniated disc. This condition is sometimes also referred to as a slipped, ruptured or torn disc (possibly also spelled “disk”). Discs make up the links of the spine, and this condition occurs when the gelatin-like core of the disc bulges out and pushes into the ligaments surrounding the disc. Often the protruding disc will also push onto a spinal nerve and cause pain in the area of the body connected to that nerve. This means that those who experience herniated discs will likely experience pain in their back and another body part as well. For the most part, treatment for herniated discs does not include surgery though it may remain an option if needed. There is no way to know who will be affected by herniated discs, when they will be affected or even to what degree they will be affected. 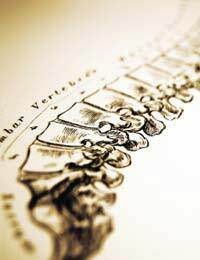 Statistics do show, however, that herniated intervertebral discs often affected individuals in their 30s and 40s, and that may report the pain starting in the morning. Sometimes individuals also describe a sharp feeling of snapping or tearing in their spine or back which is usually thought to be a tear in the ligaments surrounding the disc. Almost all individuals suffering from a herniated disc list back pain as their main symptom. This pain is often in the lower back and radiating down one of the legs (if a nerve is compressed). Many individuals describe this type of pain as sharp and/or cutting, and report that it gets worse as it radiates down the leg. Such associated leg pain may affect the ability to walk or change an individual’s gait, and the back pain may limit the range of motion and keep individuals from leaning forwards or backwards. If there is a nerve that is being compressed by a herniated disc then the individual may also feel differences in the strength and/or sensations in the associated limb or body part. Most individuals who suffer from a herniated disc do not require back surgery or spine surgery. Instead, prescription drugs may be required to help deal with pain and inflammation, as well as to help relax the muscles affected, and the individual may be advised to keep to bed rest for a specific period of time. Following this rest, the individual will likely then be told to carefully control his or her physical activity and to resume their daily activities at a gradual pace. If this type of recovery does not work, then investigating back surgery or spine surgery may be an option that the individual and his or her doctors can discuss. A herniated intervertebral disc is a common cause of back pain, leg pain and possibly even discomfort in associated joints. The symptoms of this condition is generally a sharp pain in the back and legs, particularly if the herniated disc presses on a nerve, and it may affect an individual’s range of motion and gait. Most herniated discs are treated conservatively, but surgery may remain an option if needed.